Monitor Your Pregnancy Symptoms Week by Week! Do you want to know when is the due date of your pregnancy? Use our easy due date calculator / calendar to find out when is the due date of your baby. Pregnancy begins with conception, a process that starts with an egg being released from an ovary fallowed by fertilization by a sperm that meets the egg in the fallopian tube, and completing with the fertilized egg implanting in the uterus. 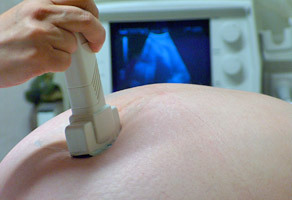 Early pregnancy signs and symptoms are explained in the fallowing section. During the first trimester of your pregnancy your baby will be developing rapidly and you may experience a host of early pregnancy symptoms week to week. Even though your body is undergoing dramatic changes you will show very little signs of being pregnant. The second trimester marks the start of visual changes in your pregnancy as fetus development continues. Energy levels should increase as early pregnancy symptoms of nausea and fatigue start to diminish week by week. The third trimester of pregnancy can be physically and emotionally challenging as you encounter a host of different symptoms in this final stage pregnancy. Fetus development of major systems are progressing in the final weeks in preparation for life outside the womb. Eating a nutritious balanced diet is vital during pregnancy to keep you healthy and provide your growing baby with all it needs to develop successfully. Some pregnancy symptoms can benefit from particular foods which is why it is important to learn what to eat when pregnant. The genes that you and your partner pass on to your baby help determine their physical and mental characteristics. Prenatal care is needed during pregnancy to monitor you and your baby and manage any problems that may arise.